As you can tell from my trio of food reviews for McDonald’s fall food items, I love my golden arches and I have the thighs to prove it. But my McDonald’s obsession becomes compulsion each fall with the return of Monopoly. I am a complete sucker. I have to collect all of the pieces. In fact, I’d probably be happier to collect all of the pieces than to collect any one set. This same mania led to a tub full of Beanie Babies after I discovered eBay an eon ago. At least they didn’t make me fat. There are two weeks left in the game. 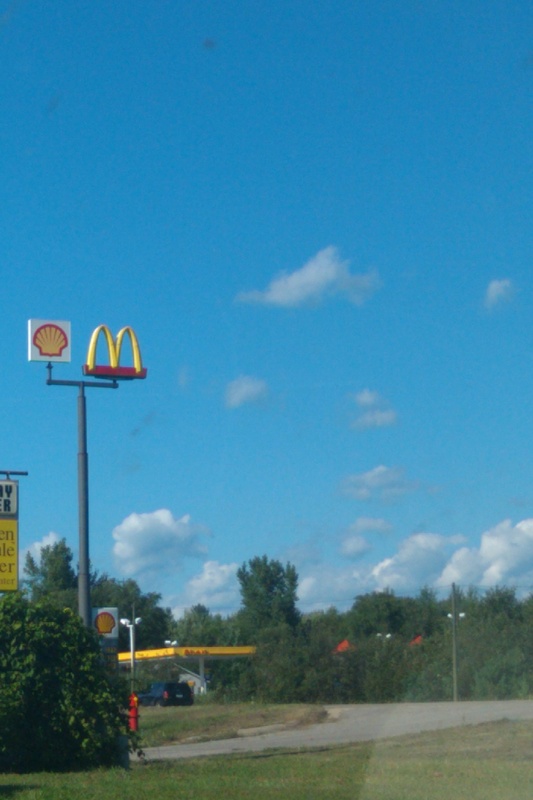 Today I realized I couldn’t “drive thru” McDonald’s if my compulsion wanted to. My stomach was in all out mutiny. I think I’ve sobered up. Now I, and my thighs, have to deal with the hangover. Hello, treadmill. If only you had a Monopoly game. I used to think of McDonald’s as fast food, but now that they’ve introduced the McCafe, I’ve experienced a radical paradigm shift. Buying a shake in a clear cup with a rounded lid filled with whipped cream and topped with a real cherry confirms that I do belong to the middle class, even if my real income has been slipping for the last ten years and my standard of living has been supported by access to short-term credit. I no longer feel inferior to those big city types who waltzed in and out of Starbucks, emerging with frothy drinks that left foamy moustaches on their patrician upper lips. Now, even in podunk USA, I can drink from the frothy trough and adorn my lip with whipped dairy product. Let’s face it, shakes are just more fun when served McCafe style. So what does this mean for the cafe’s holiday creations? I am generally sceptical of shakes that comes in toxic colors and are offered for a limited time, but, having committed to my handful of followers to review fall fast food marvels, I realized it was my duty to try the McCafe’s Sweet Autumn Shake. The corporate marching orders on the roll out for this product, however, created an initial turn off. The Cafe began offering this shake in our part of Michigan the weekend before Labor Day when temperatures were in the 90s. I am not generally rude to people in service positions, but I had to laugh at the woman taking my order who suggested I add one to my meal as I wiped sweat from my face and tried not to think about the “natural aroma” filling the car just from the heat coming in from the window while we made our order at the drive-thru. Once the weather became more appropriate to something named anything autumn, I broke down and fulfilled my duty. It was heaven. This small shake manages to convey the complexity of flavors that compose a good pumpkin pie–the pumpkin, the nutmeg, and most importantly and, most impressive to me, the crust. Before you protest, let me affirm my certainty that the Sweet Autumn Shake is full of nasty artificial colors and strange chemical combinations to give it the appropriate taste, but, hey, I put artificial colors and strange chemicals on my face every day to make it more palatable–why should my shake not get the same treatment? The glorious mix of flavors that comprise pumpkin pie. On top of it all that signature McCafe whipped cream. How do you like me now, Starbucks? Today’s post is brief and it begins a series of food reviews of special menu items created by fast food restaurants to celebrate autumnal glory. After all, Michigan’s economy has suffered tremendously in the recent recession, and, since we’re heading for another, according to economists on all parts of the economic theory spectrum, fast food will be our big night out for awhile here in the mitten state and elsewhere around the country. The new fall sundae from McDonalds offers a small taste of their vanilla soft serve ice cream topped with warm caramel and diced Granny Smith apples. The first time I tried one, the whole thing fell flat, but the second, third, and fourth tries have improved my view of this sundae. The sundae is best when the warm caramel is poured over the apple pieces, which acts to warm the diced apple and create an apple pie ala mode taste without the bothersome buttery goodness of pie crust involved. McDonalds offers the same toppings on a yogurt parfait, but I have not yet tried this fall treat. Overall, I applaud McDonalds for finding a transitional dessert for those of us who became addicted to their soft serve ice cream cones, priced at a mere 80cents here in Michigan, over those steamy summer months. I guess I just have to say, I’m lovin’ it.